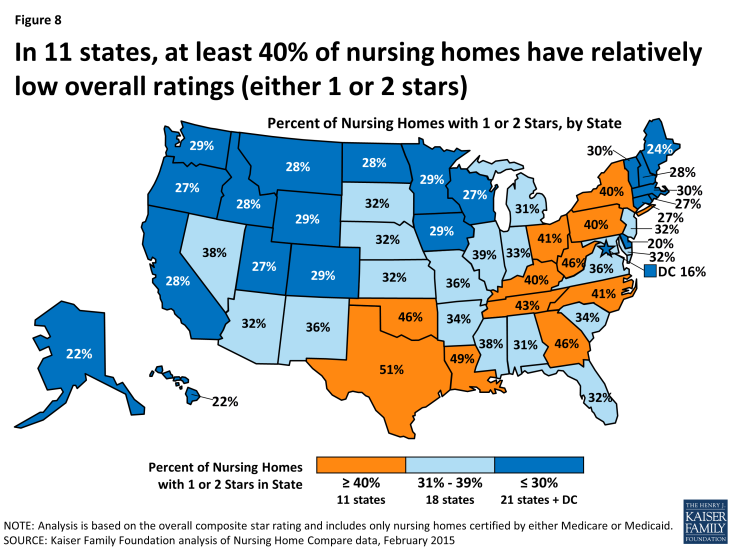 Home Health Medicare News - The Kaiser Family Foundation has released a new report stating that more than one third of the nation’s 15,500 nursing homes received a rating of 1 to 2 stars under the federal Five-Star Compare ratings system. The ratings system assigns ratings between 1 to 5 stars to all Medicare and Medicaid-certified nursing homes based on various performance markings in the staffing, inspections, and quality of care. Serious concerns about the quality of care in nursing homes have been reported for decades. In 1986, an Institute of Medicine (IOM) report identified several problem areas with nursing home care, including staffing capacity, training, and supervision and made several recommendations regarding oversight and regulation to enhance nursing home standards, particularly those that received federal and state funding. Subsequently, Congress enacted landmark legislation in the Omnibus Budget Reconciliation Act of 1987 (OBRA 87) that, among other provisions, established new minimum requirements for nursing homes eligible to receive Medicare or Medicaid payment, and put in place added enforcement systems. To carry out these provisions, the federal government contracts with states to inspect nursing homes, but states may place additional conditions on nursing homes to meet state licensing requirements. For example, some states require a registered nurse (RN) to be on duty 24 hours a day for nursing homes with 100 or more residents—higher than the federal minimum standard which requires an RN on duty for at least at least 8 consecutive hours per day, 7 days per week, regardless of the number of residents in the nursing home. In some respects, the quality of care in nursing homes has improved since OBRA 87—such as lower use of physical restraints—but nursing home deficiencies and citations continue to be prevalent. Over the past decade, multiple studies, including those conducted by the Government Accountability Office (GAO) and the HHS Office of the Inspector General (OIG) have found that significant proportions of patients are in nursing homes cited with deficiencies that are serious enough to cause harm or immediate jeopardy. Recent media reports have also described circumstances that raise significant concerns about the quality of care in nursing homes. To help consumers and their families find a nursing home and to encourage nursing homes to achieve higher quality through public reporting of nursing home performance, CMS launched its Nursing Home Compare website in 1998. In 2008, CMS modified the website to provide more user-friendly star ratings based on quality scores for all Medicare- and Medicaid-certified nursing homes. 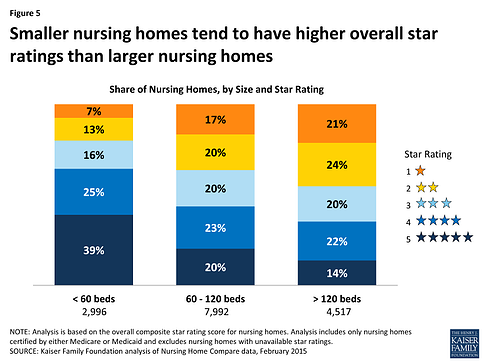 While the ratings provided additional means for consumers to compare nursing homes, some have criticized the heavy reliance on self-reported data. In February 2015, CMS modified its star rating system to begin to address some of these concerns, and is planning additional changes in the future. The current CMS Five-Star Quality Rating System calculates an overall star rating—with one star being the lowest possible score and five being the highest—based on performance in three types of measures, each of which also has its own five-star rating. These three domains are: 1) state health inspections; 2) staffing ratios; and 3) quality measures. We summarize these domains below and briefly describe how CMS derives a score for each. For more detailed information on the methodology used to calculate individual components and overall quality measures, see Design for Nursing Home Compare Five-Star Quality Rating System: Technical Users’ Guide. Staffing measures incorporate information reported by nursing homes on the ratio of nurses to residents, as measured by nurse hours per resident days. This measure adjusts for patient care needs (based on patient acuity levels) at each nursing home and includes calculations of both RN hours per resident days and total nurse hours (including additional types of nurses, such as certified nurse aids) per resident days. To receive a 5-star rating in staffing, a nursing home must have staffing levels that equate to 5 stars for both RNs and total nurses. 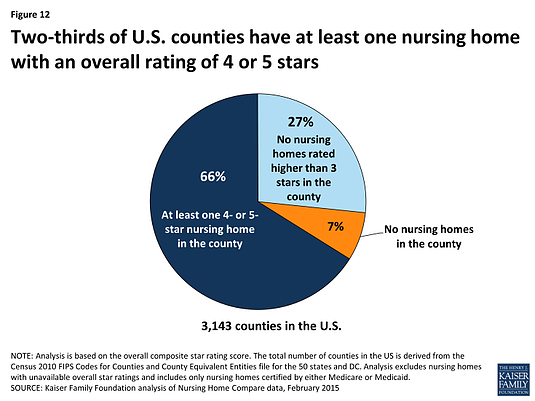 A nursing home with fewer than 3 hours of total nursing staff per resident days and fewer than 16 minutes of RN time per resident days (both adjusted for patient care needs) would be assigned 1 star in the Staffing star rating.